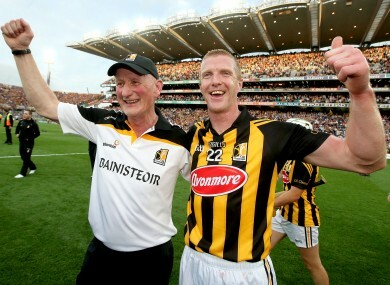 Brian Cody and Henry Shefflin celebrating after last year's All-Ireland final win. HENRY SHEFFLIN DISCUSSED his potential retirement over a cup of tea and a scone last Friday night with Brian Cody. In the wake of last week’s AIB All-Ireland club title win with Ballyhale Shamrocks, Shefflin’s thoughts turned to his inter-county future and he met with the Kilkenny boss last Friday to discuss it. “We have such a strong relationship that I did want to go down, sit down with him,” revealed Shefflin in Kilkenny today. “We had a cup of tea and a scone and chatted more about hurling than anything else. Over the weekend Shefflin arrived at the decision to call time on his career. “The (Ballyhale) match was Tuesday. So Tuesday, Wednesday, Thursday I wasn’t thinking about it, they were about celebrating. We’d a few good days in Ballyhale celebrating the great victory we had. I woke up Thursday morning and I realised now I needed to reflect. “I’d met Brian on Friday. Saturday I was becoming more comfortable with it, I was thinking this is the right thing. Myself and Deirdre (Henry’s wife) were sitting at home on Sunday watching the Clare match and I was just seeing Kevin Kelly and some of the newer players, I remembered when I started. Shefflin had batted away a persistent line of enquiries about his inter county future since Kilkenny’s All-Ireland final win last September. His focus was trained on Ballyhale Shamrocks Kilkenny and Leinster campaigns at the end of 2014 before the All-Ireland club series took centre stage in recent months. “When the club campaign was going, I was very much in the bubble of I’m still training, I’m preparing, can this go on for a few months. I spoke to some people who would advise me and they were saying keep it balanced. 50-50. “Wait until the club is over and then see how you feel. I put my focus on the club campaign.But the minute the campaign ended, I think my mind just went, with each passing day I reflected on it, the more I felt more comfortable with it. Shefflin will continue to play with Ballyhale Shamrocks while he is working on his autobiography which will be published at the end of this year. Email “A cup of tea, a scone and a hurling chat - When Henry and Brian discussed retirement”. Feedback on “A cup of tea, a scone and a hurling chat - When Henry and Brian discussed retirement”.